I'm one of those people who are very suspicious of power. 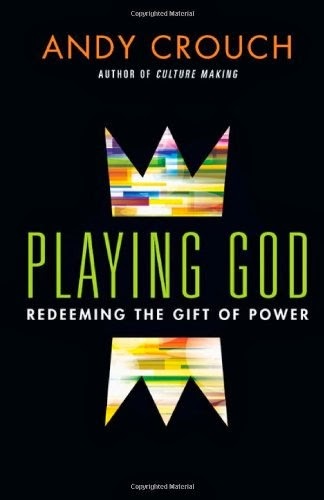 Consequently, I've had a lot of people recommend Andy Crouch's recent book Playing God: Redeeming the Gift of Power. As you can tell by the title, Playing God is an apology for power while being honest about the dark side of power. According to Andy when power is lovingly used it is a creative force for human flourishing. And you really can't escape having power. You just have a choice in how you use it. Best to take honest inventory of your power and to use it for creative and loving purposes. I agree with this, but there were times in Playing God where Andy's use of the label power is so vague and diluted that the insights can reduce to banalities. In Playing God power is often just a synonym for human activity, any and all human activity. For example, Andy describes playing a musical instrument as a form of power. But if (just about) any human activity is an expression of power then the moral directive of the book gets a bit watered down: do good things rather than bad things when you act. All that to say, I think the book would have been improved by a better analysis of power. Reading Playing God I couldn't help but try to get specific and model some of these dynamics. What do we mean by power? Thinking along with Andy in Playing God I kept coming back to two things--capacity/ability and opportunity/freedom. To have power is to have the ability or capacity to do something. But that's not all you need. You also need the freedom and opportunity to exercise that capacity. 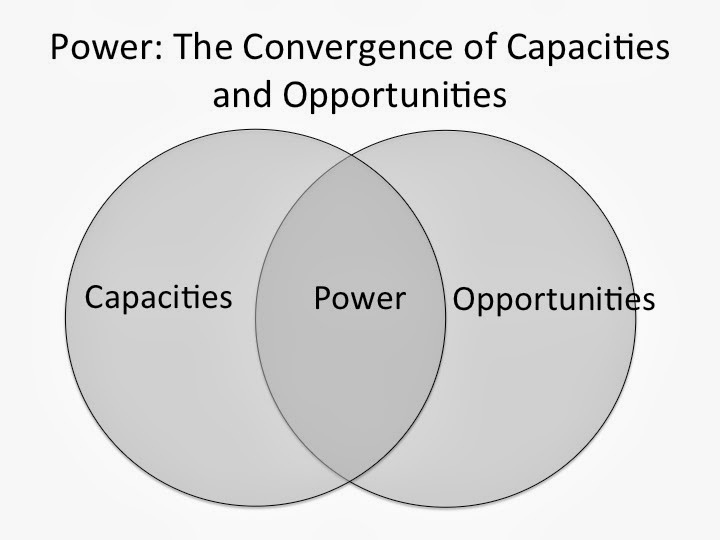 Power, then, is the overlap between capacity and opportunity. If you have both you have power in that sphere. First, we can empower others by increasing their capacities/abilities. Examples here are education, equipping and training. A second aspect of empowerment is increasing opportunity. For example, you might have some very capable and talented people but if they lack access or opportunity they will not be able to exercise power or influence. These people have been "shut out." 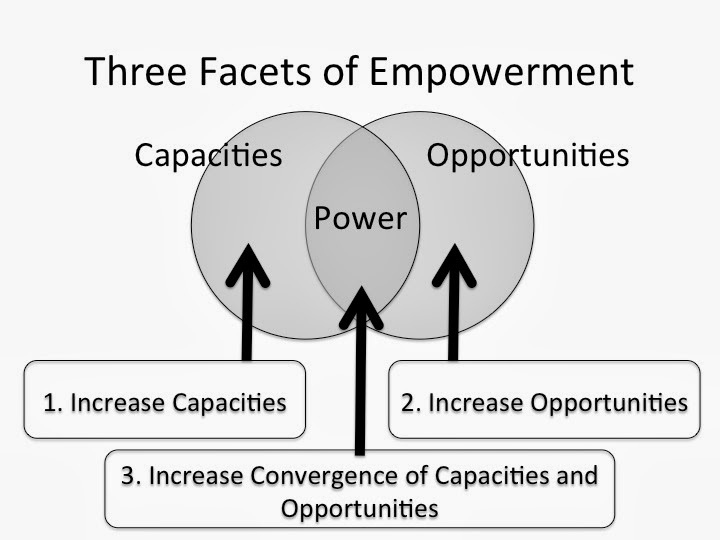 Generally, empowerment focused on capacities tends to be agent-based. We invest in people. By contrast, empowerment focused on opportunities tends to be structure-based. We reconfigure structures to create access. To use some historical examples regarding the empowerment of women and African-Americans in the history of the US. Allowing women to go to college or eliminating racial school segregation to improve education is empowerment-via-capacities, investing in the person. Allowing women and African-Americans access to the vote is empowerment-via-structures, allowing people to have influence where they had been previously shut out. A final aspect of empowerment is bringing capacities and opportunities into greater alignment. Mentoring and modeling is an example of this. Opportunities exist and the person is able, but he or she needs direction, encouragement and exemplars to follow to get everything lined up to maximum effect. You might not know you could do something until someone casts the vision or dream for you. "I believe in you, you can do this," is, perhaps, the greatest form of empowerment there is. All told, then, when capacities and opportunities come into greater and greater alignment the person has more and more power, an increased ability to affect and influence the world. For good or ill.
On the bottom is a more powerful person. Large capacities and large opportunities Incidentally, a large opportunity circle is a model of what we call "privilege." For example, being a white male I have opportunities and locations of influence that others don't have. My opportunity circle is large relative to, say, that of a woman of color. With these large areas of capacity and opportunity you can see how the more powerful person is operating out of a large center of power. Above is a less powerful person, a person with fewer capacities and opportunities and, thus, a smaller center of power. 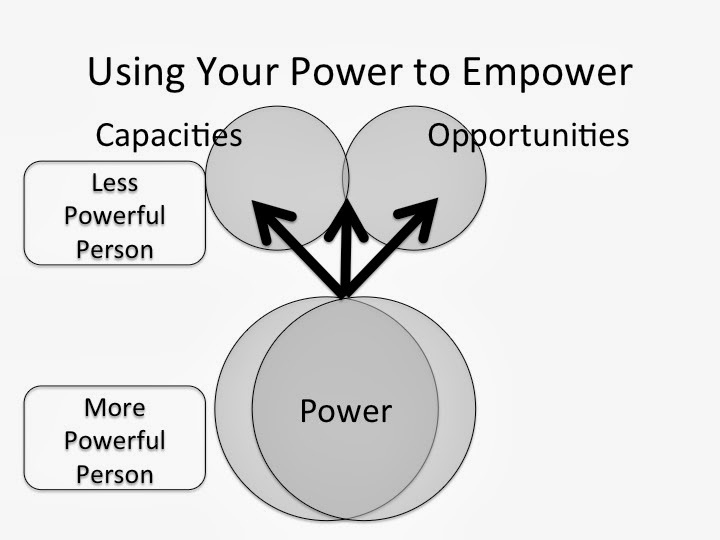 The loving use of power that Andy envisions it is, then, the powerful person using his or her greater power to empower the less powerful person via the three routes of empowerment. That is, using your power you can invest in the capacities of others, increase the opportunities of others, or work to bring these into greater alignment (to catalyze and actualize the power of the other). To give an example using an issue I care about: empowering women in the church. As I've argued before, when men in the church use their power to inhibit women from expanding their capacities and/or opportunities we have an example of disempowerment, what Jesus calls "lording over." By contrast, the empowerment of women comes when men use their power to increase both the capacities and opportunities of women in the church. For example, you increase the teaching and preaching capacities of women in the church by providing young women teaching and preaching experiences so that they might become better teachers and preachers. You help women cultivate their Spirit-filled gifts. Then, downstream, you give these women the opportunity to preach and teach. In a similar way, I think Christian universities desiring to empower women should attend to opportunities as well as to capacities. I think a lot of Christian universities think it's sufficient to enroll and grant MDiv degrees to women without attending to the opportunities to preach (or lack thereof) that exist in the churches. 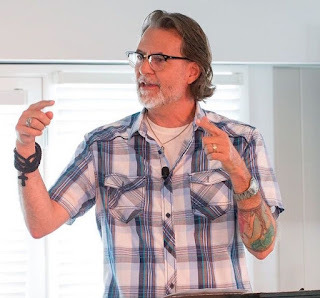 To be sure, Christian universities can't tell churches what to do, but Christian universities can start conversations, begin initiatives, and shape the imaginations of the next generation of church planters. 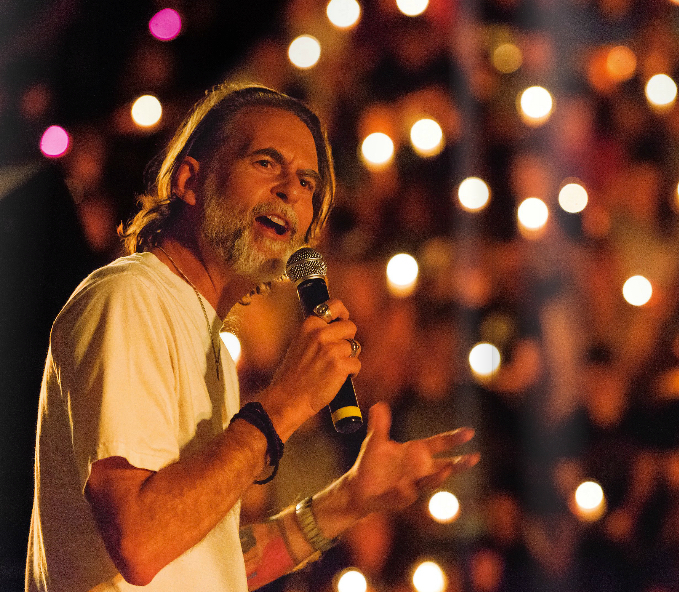 Christian universities can also create opportunities in allowing women to preach at events hosted by the school. This is one reason why in my own tradition I'm a strong supporter of the One Voice for Change initiative in asking our universities to invite women to deliver Keynote sermons at our Bible Lectureships. In doing all this, in increasing both capacities and opportunities, you empower women in the church. An empowerment that leads, per Crouch's analysis, to the creative flourishing of women and the church. Where everyone is using their power to empower others. A couple things come to mind as you parse power in such a clear way. 1. This diagram depicts exactly what's being portrayed in the Christ-Event: two embodiments of God, one is Caesar and one is Jesus who is declared the Christ by the people who see in him something very different than what is seen in the Caesar; Jesus is modeling the infusion of power into others in service of spreading human flourishing. Caesar on the other hand is modeling the vacuuming of power, in service of consolidating power and flourishing to his selected group- the people then, become merely the infrastructure that's needed for this way of life. A way of life that is today played out in what I call Free Market Fundamentalism. 2. Richard notes that one of the most empowering moves one can make is to believe in the one you might be mentoring and telling them so. If this be the case, what would it be like if god believed in us? If god didn't, why not? What would it take for god to believe in human life? In answering the second, I would begin by noting that it would require from us a different kind of accomplishment than the one made by Free Market Fundamentalism, that today in American culture, stands as the pinnacle of accomplishment. Richard, as you know, power is a particular theological hobby-horse of mine. I think what you've done here is excellent, but I think it needs to go farther. I think its possible, though less likely, to use power for others but still have it be an embodiment of the ways of the principalities and powers. Your capacity-opportunity dichotomy doesn't really work for me. You alternately describe it as something like an intrinsic-extrinsic dichotomy, which I don't buy. Maybe that's not terribly important. I do think that the fundamental question of the book *is* terribly important (viz., "Is power redeemable?") because it's an eschatological question that bears on our ethics so strongly. As someone who's struggling to truly comprehend -- if not fully appropriate -- Anabaptist thinking on power, I'm more unsure than ever about whether or not to judge as good any specific exercise of power. I think that's true. The model described is "disembodied" from structures. Too idealized and abstract. Then again, as I ponder it, I think the model can accommodate some of this. That is, what sets the boundaries of my opportunities? More often than not, it's the structure I'm embedded within. I'm too far down the power hierarchy or hemmed in by bureaucratic procedures. Empowerment within these structures happens, then, when people who have the power to affect change within the system (generally people at the "top") remove structural barriers so that more and more people can affect the structure. Affect not just the aims of the institution but how the institution goes about its business. I've heard this called "flattening hierarchies" in some management books. For example, in hiring new faculty members I'll have the administrative coordinator interview them as well as the faculty. He/she gets a say, a bit of influence, that previously didn't exist before. I use my power as Chair to give him/her power in shaping the future of the department. Still, I tend to think people are fairly powerless in the face of institutional pressures. That our powers are very anemic by comparison. But I don't think that asymmetry affects the model. It just means that our circles of power within institutions are going to be pretty small (i.e., we have much less power than we think). Can you tell me why it doesn't work for you? It seems pretty obvious. Do I have power, say, to lift a rock? Well, I have to have both the strength to lift the rock (capacity) and be near the rock (opportunity). If either of those are lacking I don't have the power--at the moment--to lift the rock. Did a slave in the US have the power to elect the next president to change the slave laws? They surely had the capacity to vote but lacked the political opportunity to do so. The slave lacked political power (enfranchisement). Examples abound here. So I'm not sure what the sticking point is. I think this is relevant because you can't get to the bigger question--Is power redeemable?--without defining power in a very specific way. For example, if playing the cello, to use an example from the book, is an example of power what does it mean that playing the cello is "redeemable"? As usual, you've put the cookies squarely on the bottom shelf, bringing a systematic clarity to otherwise elusive ideas...perhaps the biggest reason I love this blog. Plus, the application you make is perfectly apt. There is a recursive (not to say, incestuous?) aspect to the "structures" part of the model, namely that the answer to the question, "who gets to say what the structure ought to be?" is the person who already is in control of the structure to begin with. And in the "principalities and powers" framework, that appears to give prophets their marching orders: drawing people's attention to an alternative construing of reality (_sensu_ Brueggemann) and delegitimizing the establishment that gives the recursion its staying power. Incidentally, and in a somewhat Yoder-esque ("all spiritual reality is political") vein, this is precisely why qb cannot understand the disproportionately race-correlated, progressive agenda that concentrates executive power to the extent that we are observing today on the American left. ESPECIALLY when the track record of progressivism in terms of actual, population-wide benefit is so *ahem* sparse and the evidence of increasing dependency and "disempowerment" of the Beltway's ostensible beneficiaries so acutely obvious. In that light, it is the Thomas Sowells, Shelby Steeles, and Walter Williamses of the world who may be the voices crying in the wilderness. That's a whole other dynamic I pondered in thinking through the model I sketched: how to you model (with nifty little Venn diagrams!) relinquishing power to empower others? My first idea was to show the powerful person's power circles getting smaller and making the less powerful person's circles bigger. Sort of like a transfer or pouring out of power. But then I realized that it doesn't really happen that way. If I forgo an opportunity to make room for someone else that doesn't mean my opportunity circle shrinks. So maybe overlapping opportunity circles, where my opportunity is shared (overlapped) with another person? I thought about that a bit. And then descided, shoot, I need to get to work. And left things as they stand. Sadly, there seems to be a limit to what Venn diagrams can accomplish in the world. All that to say, this whole other dynamic you point out is something I wanted to fit in. I find myself a walking contradiction many times. I rave about the principalities and powers but tend to be politically liberal, a group who, generally speaking, have a more optimistic view about what institutions can do. Liberal as in democracy. Liberal as in the 13th and the19th Amendments. Which is to say, if you are an American you are liberal. If you are a Republican you are liberal. If you are Democrat you are liberal. Liberal, per the model of the post, as in perfecting our union to the extent that the capacities and opportunities of all our citizens are expanded. And so, the great debate of our time, in my estimation, isn't about so-called Conservatism and Liberalism. The great debate of our time is the relationship between capitalism and popular democracy, and the growing sense among some of us that free markets aren't the best way to perfect our union and that the logic of free markets has usurped the populism that fueled the great liberal advances of our past. The great debate of our time is if capitalism has come to replace democracy. I think it has. Others disagree. Regardless as to how one answers that question, the options before us are grim. I believe that the consumptive, competitive and acquisitive spirituality of the free markets is a dark force at work among us, a corrosive acid. But so is the corruption, waste and bureaucratic insanity of governments. These are the sordid tools we must use to negotiate the balance between capitalism and popular democracy. I don't think any of us escape the principalities and powers during the Fall. We can only hope to make them as humane as possible during our time on earth. Maybe it's not about relinquishing then, because you're right: my circle doesn't necessary shrink. I think the overlapping idea is on the right path - I also think about it as a fading away of that side. That circle can be so overwhelming, so dominant, but by stepping back, by making room for others, by shutting up and sacrificing (as Black Girl Dangerous recommends), maybe the weight of that circle decreases. Its influence "lightens" as we fill someone else's. And maybe it doesn't actually lighten, but the fact that it might is what's scary, right? That's why it's difficult because, at the end of the day, power and privilege help us out a lot. It can be hard to let those go. When I read this book last year, I kept wishing you would read it so we could talk about it. I love the way you broke it down here. I would love to hear your take on how Crouch defined the good potential institutions can have, as a pattern of life to be passed on from generation to generation. I thought he had a strong enough view of the Fall to talk about the ways that institutions can be just brokers for the Principalities and Powers i.e. Prison Systems, but he also seemed to be very hopeful about what role institutions can play in flourishing. I should have been more clear: I find the line between intrinsic and extrinsic to be sufficiently arbitrary that it's not very useful in a general explanatory model. The chair-bound paraplegic/double-amputee (pick the one that you think taxes the model more) lacks power to ascend the stairs because capacity and opportunity don't align. But anything that *you* call lack of capacity (say, legs or a fully functioning spinal cord), *I* can call lack of opportunity (lack of access to same). The lack of power is the same by either perspective (I could be wrong here), but the explanations for the lack differ. By moving the intrinsic-extrinsic line, we could offer competing models that claim that lack of power equals lack of capacity or that lack if power equals lack of opportunity. Both explain equally well, it seems to me, and so neither adds much to our understanding. The modeling question seems much less important than the question of power redemption. Is all power violence? Can the gospel or the kingdom of God or human flourishing be advanced by power or property? Can God achieve God's goals through power? I can see that. I see places where there is overlap. But I also think a lot of the overlap can get cleared up with cleaner definitions. And I also think there are locations where is distinction is clear and legitimate. Back to your question, Is power redeemable?, I can only go back to the fundamental issue: define power. Can't answer your question without a firm definition of power in hand. If power just means "causality" than, yes, causality--generically speaking--seems redeemable. But if power is, say, "corersive caualiaty" (what might call "force") then I'm skeptical about its redemption. I think Andy's book is just making that distinction. Causality isn't bad per se. And it isn't. It's just causality, the ability to make something change or happen in the world. And if that's all power is--the potential, via ability and opportunity, to cause effects in the world--then the question "Is power redeemable?" is stripped of a lot of its drama. The simple answer is, "Depends." This is hands down the best, short treatment of power and privilege I've read. Thank you much. Really enjoyed this, can't find a 'like' button so this is my appreciation!